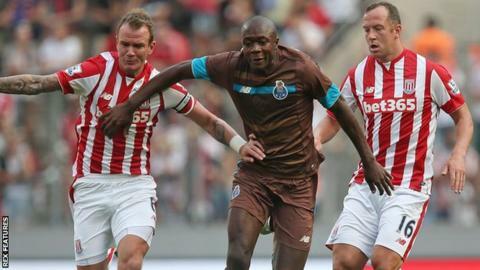 Stoke have broken their transfer record to sign midfielder Giannelli Imbula from Porto for a fee of £18.3m on a five-and-a-half-year contract. The 23-year-old became Portuguese football's record signing when he joined Porto in a £15.1m deal from Marseille seven months ago. He has played for France Under-21s, but could also play for Belgium. The Potters have let Chelsea midfielder Marco van Ginkel leave his loan spell early to join Dutch club PSV. Dan Walker, Danny Murphy, Jermaine Jenas and Henry Winter discuss the big deadline day signings. The 23-year-old, capped twice by the Netherlands, had played 21 times for Stoke during a season-long loan spell, but he will now be in Eindhoven until the summer. Stoke's previous record deal was winger Xherdan Shaqiri, who cost £12m in the summer. Imbula, who started his career at Guingamp, played in both of Porto's Champions League games against Chelsea this season. Potters chairman Peter Coates told BBC Radio 5 live: "If he is as good as we think he is, he'll keep his value. You've got to think of it from a business point of view. We want him to be worth more than we paid for him. "This move has been on and off for a few days. We said we were withdrawing the offer, then they came back." Stoke midfielder Charlie Adam told BBC Sport: "We played Porto in a friendly in Germany last summer and I thought he was excellent. "He went off injured because I gave him a little kick and gave him a dead leg, but he showed against us that he has the right qualities to play in England. "I would say he is a Patrick Vieira type - a strong and powerful midfielder, a real driving force in there and perfect for the Premier League."